I wrote this song in a different way. I was sitting on the front porch of my parents’ house in Watchung, NJ, watching one of those dramatic summer thunder and lightning storms that come up quickly in the suburban rain forest, when the entire lyric came to mind. I ran upstairs and wrote the whole thing down on a yellow legal pad, and then shortly after came up with the music on a Gibson Dove that I had bought used from a guy in Albert Einstein’s old neighborhood in Princeton. (BTW the song isn’t a death wish- it’s about inspiration.) I remember recording a simple demo on my friend Alan LeBoeuf’s 4 track reel to reel Teac 3340s (the first popular recorder of its kind that could record 4 tracks- he later sold it to a fellow cast member of the Broadway show “Beatlemania,” Marshall Crenshaw, who presumably used it to record the demos that led to his signing with Warner Brothers.) The song was short at this point, and my producers were somewhat underwhelmed by it. During the course of the sessions I was playing the piano one morning before I left for the studio, and I came up with the intro figure and over all feel that ended up opening (and lengthening) the song. I played it for Spinozza in the quiet of The House of Music’s beautiful Studio B (which had a great little Yamaha baby grand, little brother to the bigger one in Studio A) and he got excited by it- he suddenly heard the song as a record. Chris Palmaro contributed ideas to the arrangement- tightened it up. We recorded it at night, Spinozza dropping his pants and running around during the up-tempo part…I saw normally business-like studio guys literally fall out of their chairs with laughter. I guess it loosened them up a little! It’s probably the one song that turned out most differently than I had envisioned it- I thought it would be harder rock. Of the three guitars, my gold top Les Paul rhythm part is the most distorted. I played the two solos; I had originally imagined that the outro would be a guitar dialogue between me and Spinozza (certainly not a “duel,” as that is one duel I would have roundly lost), but as I started to record it the phrasing turned out to be better for one guitar. I “produced’ the mix as both David and Al weren’t available, and by that time they trusted me to know what I was doing. In those days, that was the beginning of my lifelong love of mixing. I have musician friends who hate it, as all the final decisions have to be made, but I liken it to when an artist has all of the colors of their paintbox at their fingertips. BTW when the execs at London heard it they decided they wanted it sequenced first on side one, but I always thought of it as a jam tune and so changed it to where it is now. Spinozza, Al Gorgoni and I met for hours one long afternoon at David’s apartment. I can’t recall for sure if we had more than one preproduction get together- but my best recollection is we had two. In any event we covered a lot of ground, and we had some good chemistry from the outset. When Spinozza had approached me on the phone about having Al co-produce I was instantly onboard for an unusual and coincidental reason: Al (and Estelle Levitt) had co-written one of my favorite Chad and Jeremy songs, the psychedelic “Painted Dayglow Smile.” On this Manhattan afternoon I asked him about it , and was shocked when he told me it had been the album’s single! As enthusiastic as Spinozza had been about “Robert Johnson,” that's how Al reacted to “November.” (I played it for them live- I never did record a demo for it.) I was happy later that he did the string chart even though it was the one that I changed “on the fly” the most. (The string session may have been the most nervous one of the album- we had three hours to get four songs, and it was going to cost $5,000. There was no getting them back for another session if we didn’t get everything done.) Al had written what I thought was an overly busy couple of lines in the last verse, and he was amenable to quickly changing them to what I hummed him. 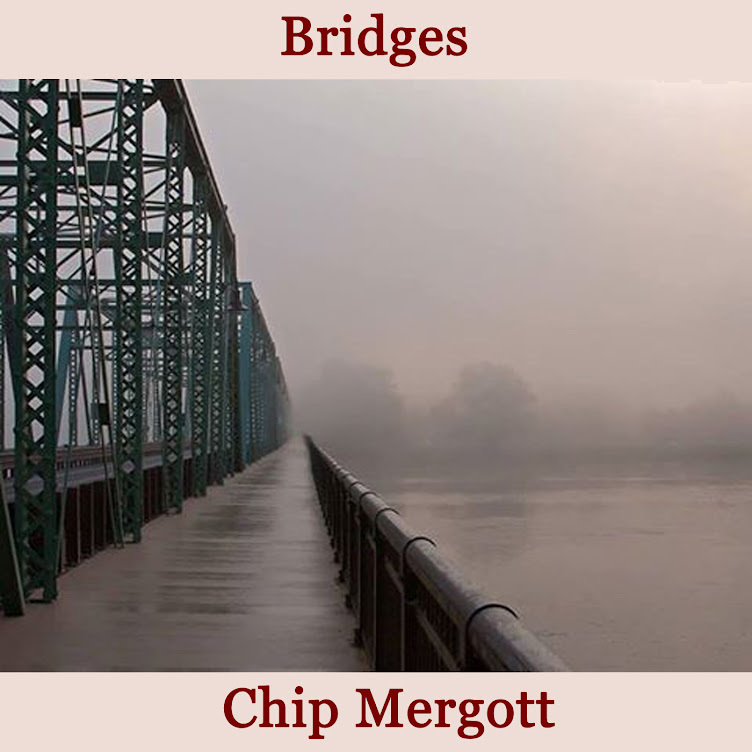 They come after the lines “Our love was a flash fire burnout,” and “Our love was a crossing of ways.” “November” strikes me as the song on “Bridges” that’s most of its time- it’s pure 70s singer/songwriter sensitivity with my version of a “poetic” style lyric. It’s the only one of a number of songs that I’ve written with the word “November” in the title that came to fruition. Chris Parker played the snare with brushes on the basic track, and when we came to mix it it just sounded like white noise. The engineers came up with a solution though: they noise gated the snare track and so you only end up hearing the hit and not the swirling around. All these years later I’m surprised by how much I enjoy the kind of free form finger picking guitar part, and I love Chris Palmaro’s Fender Rhodes electric piano solo. He was fairly new to session work in those days- Spinozza was breaking him in (as he had done earlier with the drummer Rick Marotta) and he brought some freshness and enthusiasm to the songs he played on, and in fact was just an enjoyable guy to be around (a quality that has contributed to the success of many in the recording world over the years, a super competitive field.) When I hear his solo now I recall that it was kind of composed- it took some thought, it wasn’t just improvising around until he found something. I created a second acoustic guitar part up on the neck for Paul Simon to play, as Spinozza had shared with me that he would have been happy to do a session for us, but ultimately the song didn’t really need it, and I didn’t press the point as we got down to the wire of trying to finish everything on time and within the budget. London’s vice president, Walt McGuire (cited amusingly in Keith Richards’ book), took the opportunity to complain dramatically when we went over the original budget of $75,000. coming in (after the string session) at $83,000. I want to mention here that unlike numerous other records made in the 70s, “Bridges” did not have a cocaine budget in the margins of the recording costs. Was there coke around the studio on a fairly regular basis? Yes, but I never witnessed a single musician or member of the production team use it in the course of a session. We recorded the basic tracks in the big beautiful Studio A at The House of Music in the late fall/early winter of '78. (I later replaced my acoustic guitar part with one that was recorded- and isolated- better. I used my rosewood Guild D-50 with a set of light bronze strings, custom made in Asbury Park by my guitar tech, Phil Petillo, who also did all the guitar work for two other locals, Bruce Springsteen and Jim Croce.) As we were running it down, with Chris Parker creating an infectious groove that was influenced by one of our heroes (drummer) Steve Gadd, Francisco ("Frankie") Centeno started to play this fairly unconventional melodic bass line in the intro, with long sustained (instead of short, punchy, rhythmic) notes. I remember that I didn't know how I felt about it; but I deferred to Spinozza, who loved it, and helped Frankie complete the idea. The bittersweet part of this memory is related to the cold, gray day near Christmas, when Spinozza brought his old friend (and in some ways, mentor) Hugh McCracken in for overdubs. Hugh, an A-list guitarist with a lot of prestige (he played with John Lennon, Paul McCartney, Paul Simon, Steely Dan, countless others) was a quiet man in a loud business. I noticed how Spinozza acted with respect and affection, bestowing a Christmas present on him at the session, and treating him like an admired elder statesman, even in the context of joking around, as he often did. But what happened next turned into a little bit of a runaway train for me. I let them do their thing, Spinozza suggesting that Hugh (who was the go to guy in New York those days for both slide guitar and harmonica playing) create a part on slide and then double it on harmonica, a process that took a good deal of time. The problem was I didn’t really like that direction- it sounded weak to me, where something strong and even a little wild was needed. Bonnie Raitt had volunteered to play on the album, and I had considered the idea of her playing slide on this song about the world’s most incomprehensible, and supernaturally talented slide player, but there was no way I was going to stop these two old friends from following their instincts, and enjoying themselves. After Hugh nailed a beautiful rhythmic “harp” accompaniment to the bridge, he came in and, even as a man of few words, stated “That’s my favorite kind of harmonica playing.” Spinozza, who was obviously pleased, deflected the comment with a session guy joke “Who cares what you think?” It ended up being the one (brilliant) part of the session that made it to the final mix. Ultimately I asked Spinozza to replace the other parts, which he did (initially reluctantly, for obvious reasons) with some of the most blistering, bluesy leads he had ever committed to record. Almost symbolically, he blew up John Tropea’s Roland amp with four bars to go- we had to send the amp out to be fixed, and if you listen you can hear the break at the end: the last phrases were recorded two weeks later. As Hugh was leaving, I remember him taking off his glove to shake my hand- a class act. But he basically never spoke to me again- and I really couldn’t blame him. The second cut off "Bridges" was one of the few times we struggled in the studio. This song was also taken from real life, although Mary Martin (the A and R person at Warner Brothers' New York brownstone) wrongly assumed it was about her. I remembered when I was writing it in my bedroom I was vaguely influenced by The Eagles, but as I'm the furthest thing from a Country rocker I got to a point where I wanted to do something with it that was more adventurous musically. I think I was around 22 or 23 and my friend Alan LeBoeuf (Baillie and the Boys, Beatlemania) had turned my head with his creative, even radical approach to writing pop songs. (I loved his songs so much that a few years ago I recorded a tribute album, "Gratitude," which isn't really for sale anywhere except through me.) The song is in G, and when I got to the chorus I modulated to Bflat- that was what I was looking for. Spinozza and the great R and B oriented players in New York had taught me lessons about the groove (check out the rhythm section of "She's a Ride" on Asford and Simpson's "By Way of Love's Express" for example) that would last a lifetime, but drummer Chris Parker (whom I was honored to work with) struggled with the shifting feels between the verses and choruses. He wasn't comfortable with it, and in fact verbally expressed his discontent, even asking this green 25 year old "artiste," "Chip, how many hit records have you played on?" Spinozza quietly got us back on track by responding "Chris, it isn't there yet," which Mr. Parker accepted with good grace. We worked on the basic tracks over two full nights- I think we were up to around 25 takes when we got it. Later I remember dictating the middle of the song solo to Spinozza as we sat close together in the control room; the slide parts were all his idea, and he (and I) really loved the sound of them- they scream at the end of the last chorus. But it's his outro solo (done in one take) that's now a high point of the entire album for me. Amazing to sit there and watch him do it- and then do a second take that was equally as good and say "There- now you have a choice." Later, this same guy, who also did the legendary "Right Place, Wrong Time" solo in one take, would call "She's a Ride," "One of my best solos." The original tracking session at The House of Music in West Orange, N.J. had been me on piano, Jay Leonhart on bass, and Chris Parker on drums. The song goes into "ad lib" (rubato) time at the end of the bridge, and I remember that Spinozza came out in the studio and conducted us (with a drumstick as a baton) like a mini orchestra. I don't remember how many takes we did but I'm sure it was under ten- I think the final take was around five or six. Spinozza later overdubbed his beautiful and famous old 50s Telecaster, and also did the very in the pocket acoustic strumming. My recollection is that we borrowed John Tropea's new Martin M-30- I don't think David had his go-to Guild D-40 with him that day. (The D-40 is heard on Paul McCartney's "Another Day, " among many other records- and sadly is no longer in existence.) I added background vocals at "Counterpoint," and we mixed it in West Orange sometime in early to mid 1979. Even though, as a lonely, socially awkward teenager, I wrote it about a real person, it never became popular enough to provoke any "You're So Vain," "who's it about" kind of mystery- nobody's asked and I've never told. Everything on the Bridges album was influenced by The Beatles, directly or indirectly. The one degree of separation here is producer/guitarist David Spinozza, who played with every Beatle except George. Giles Martin (son of Beatles producer George Martin) has done an excellent job again in remastering the songs for the new cd/dvd release "The Beatles 1 (2015)." I'm not going to go into the technical aspects of mastering here but suffice it to say that with today's technology eq and other components can be controlled with such pinpoint accuracy that recordings can almost sound like new mixes. I'm working my way through the album and here are some random observations: "Ticket to Ride" sounds great- the drums, particularly the snare, has some new presence, as does John's rhythm guitar. Without just cranking up the bottom end there is some new punchiness to this and others. "Paperback Writer" (always a weird mix from day 1) particularly sounds good in this regard- it's really gutsy; by far the best version out there now. I'm sensitive to too much bass as a device but "Lady Madonna" is now thunderous on the low end, as is "Get Back" and they're both the better for it. "Get Back" starts to approach the sound of actually having The Beatles in the room with you if you really crank it up. "Madonna" packs more sound into a little over 2 minutes than almost any record that comes to mind. "Come Together" is thunderous- another "they're here in the room" moment. "Yesterday" sounds great, particularly Sir Paul's voice and guitar; the strings are hard panned to the side again but that's fine. "We Can Work It Out"? Never better. The only questionable move in the entire collection is a reduction of the harmonies in the "Ah, look at all the lonely people" bridge of "Eleanor Rigby," resulting in Paul's vocal (the melody) sounding louder on the right channel. And unless I'm mistaken here's a great little bonus for the really detail oriented fan: the fade out in "Hey Jude" is extended for just a second or two- enough to hear McCartney sing (very faintly) one last note that I personally have never heard on any previous version. Chip's Recent Performance of "Robert Johnson"
Flynn, Steve Philp, Alan LeBoeuf and Nick and Roxanne Mergott. Special thanks to Peter Hay. 2015 Notebook Records All rights reserved. Template last updated 7/21/15. Simple theme. Powered by Blogger.